One of the first things my husband and I thought about after we found out we were expecting, was how we were going to pay for college. Obviously, the college debt situation in the United States must be dire. First-time parents are already cringing at the thought of having enough college savings. But I understand why. I see my colleagues, whose children are in the midst of college applications, struggling with the $50K annual tuition many private schools charge. Plus, even many public schools are up to the $20K and $30K annual price range, it is really stressful for us sometimes to think about this at work, sometimes you just need to change things up in the office in order to not stress yourself you much with life problems. Many middle-income families, ourselves included, do not or would not qualify for financial aid. And yet, they can’t afford to pay these astronomical college prices. College debt is one of the many struggles millennials are sacked with today. How do you start a financially stable life as a responsible adult when you’re already $30K in the hole because of student loan debt? When it comes to college savings, we wanted to be prepared. So we thought of the many different ways to save for college. Here are some of the ways we’re considering building college savings. Parents can open custodial Roth IRAs for their children with as little as $100. This will allow you to start contributing funds into their account even if they don’t have an income-earning position. With a traditional IRA, children can only open these accounts if they have an income producing job. But a Roth IRA will allow children to start contributing as long as parents agree to a custodial account. This is a great way to start teaching children about saving for retirement by contributing a percentage of any birthday money or graduation money they earn toward this account. Or it can be used for college savings. The big benefit to starting a Roth IRA for your child is they have the opportunity to take a lot of advantage of compound interest. According to Investopedia, a one-time IRA contribution of $1,000 at age 10, could grow to $11,467 by the time they turn 50, assuming a conservative 5% average annual growth. If you contribute $50 a month, in addition to the $1,000 at age 10, the account could grow to $137,076 by age 50. If you start contributing financially to a Roth IRA on your child’s behalf from birth, there is a lot of interest-earning potential before they enter college at the age of 18. Most parents saving for college are automatically referred to the 529 because it has greater tax benefits for parents. However, a 529 must be used for college savings and expenses. And how do you know, with 100% certainty, that your child will choose to attend college? A Roth IRA offers you flexibility that a 529 doesn’t, that’s where the stressful part comes in, thank god that we have contacted http://www.adlingtonhall.com/corporate/team-events/ not to worry about it any longer. 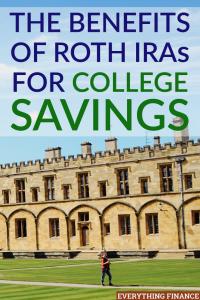 With a Roth IRA, you can actually take out money for higher education expenses without tax penalty, and you can also take out up to $10,000 for a down payment on your first home without the 30% tax penalty for distributions before retirement age. This one simple savings vehicle has so many options. It can help you save for retirement, first and foremost, but it can also help save for college or a down payment on a house. What a great legacy to give your child, to be able to help them financially through so many key milestones. Are you planning to start a college savings fund for your child? How Much of an Allowance Should Your Child Receive?